A gas stove and electric stove have two different types of burners. A gas stove has a small, cylindrical-looking burner that gives off a flame. An electric stove has a circular burner that turns red as it heats up. Both types can easily be removed from the stove with a gentle tug. It's important to properly clean both electric and gas burners to remove food, grease and stuck-on particles. Normally you can scrub a burner with soapy water and a sponge, but you can also clean burners without having to scrub them. Gas stove burners give off a flame when turned on. Rinse off the stove burners in the sink. Place the stove burners in the dishwasher. Fill the dishwasher with dishwashing detergent. 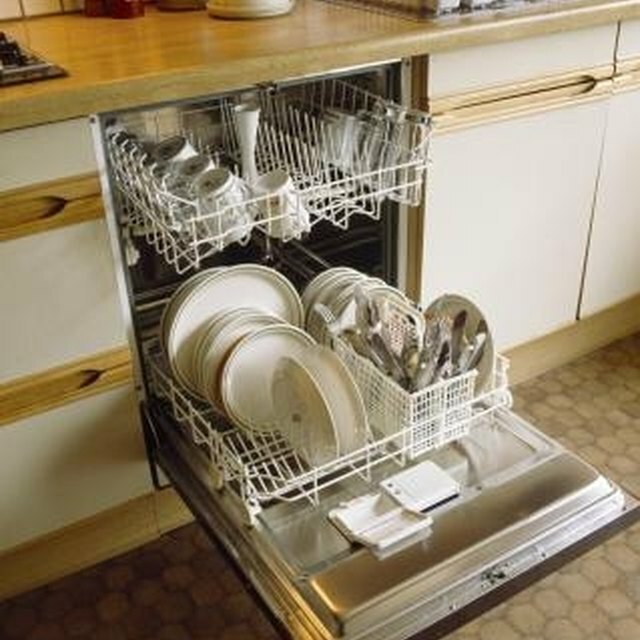 Set the dishwasher to "Pots and Pans" or its strongest setting. Turn the dishwasher on. Remove the stove burner as soon as the dishwashing cycle is complete. Towel dry the stove burners to prevent water spots. Spray the stove burners with an oven cleaner. Place them on the oven racks. Turn on the oven's self-cleaning mode. Remove the stove burners from the oven when the cleaning cycle is over. Rinse them in sink water to remove any residue. Towel dry the burners and reattach to the stove. Never use the dishwashing method with electric stove burners. Thrifty Fun: How Do You Clean Gas Stove Burners?